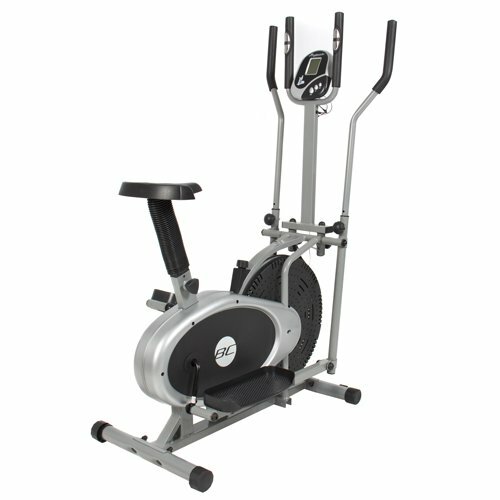 This elliptical provides a unique and innovative design that allows for the motions of an elliptical cross trainer or a bike, providing you a machine with two functionalities. You can also monitor via the on-board LCD display (time, distance, speed, and calories) while you are doing your great upper and lower body cardiovascular workout. The adjustable tension knob is provided to fit you need to work out at any level. The arms move with handlebars allow you to activate the muscle groups of your upper body. This elliptical is lightweight, compact, and wheels away easily for convenient storage. We purchase all of our products directly from the manufacturer, so you know you’re getting the best prices possible.